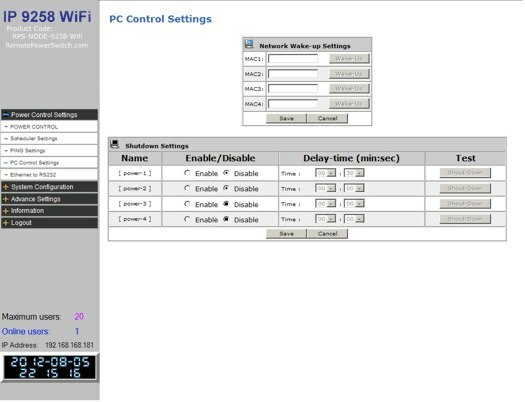 WiFi Network Remote Power Controller. Use your wireless network to connect to this device over the internet. 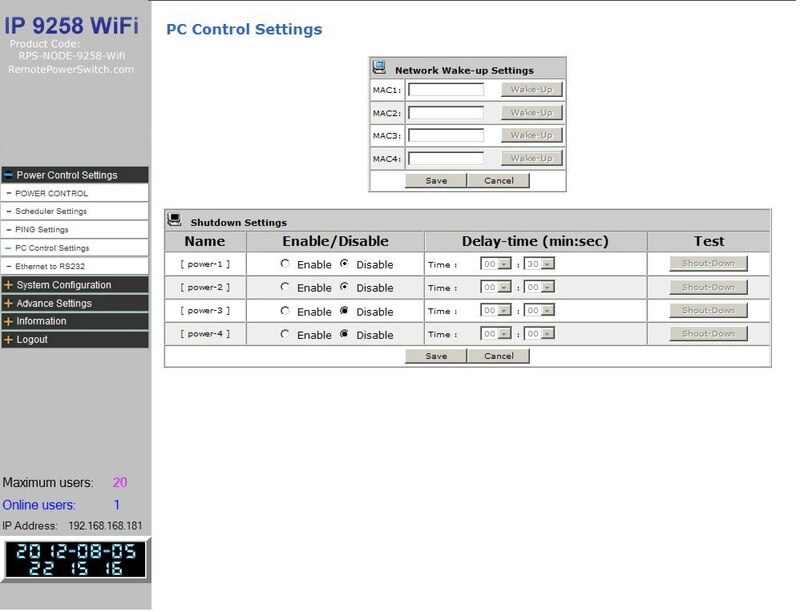 Wake-On-Lan Settings: The Network Wakeup link is available and allows issuing of a Wake On Lan command to the MAC address of the network card for a computer on your network. The computer’s main board must support the WOL function and have the WOL cable connected to your main board or network card. The feature and configuration is available on the RPS-NODE-9258-WiFi but it is up to the user to make sure their computer is properly configured to use this feature. Enter the MAC address, select SAVE to Save the information. Once saved, click the Wake-Up button to issue the Wake-On-Lan command. Shutdown Settings: Allows you to set a Delay on the individual power ports before a command a submitted command is performed. Selecte Enable and the desired Delay Time. Select SAVE to store the configuration. 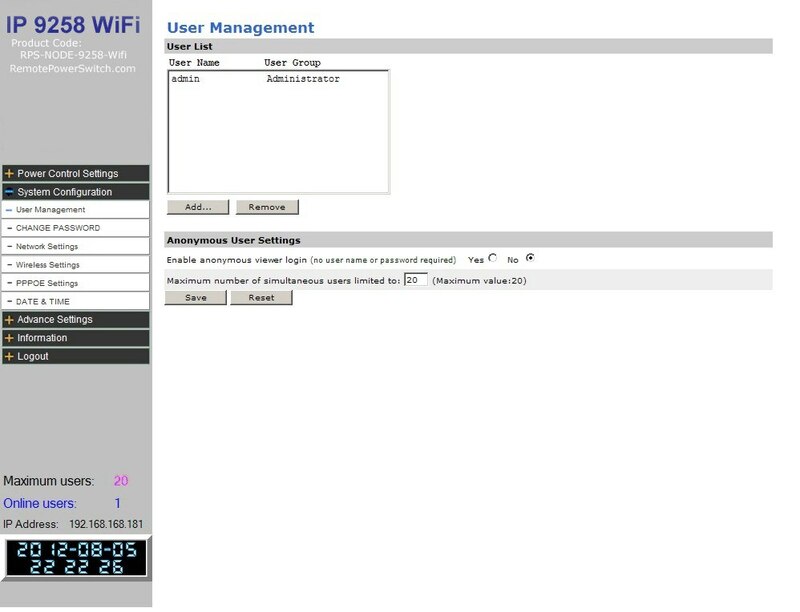 The User Management section allows you to create users that will be able to access the RPS-NODE-9258-WiFi. There are 2 types of users. An Administrator has the authority to create other users, remove users and control the device. The Guest access level only has the ability to view and operate the device. All other functions will be disabled. Click the ADD button to add a new user to the system. Enter the User Name, Password and User Group into the menu and select SAVE. Up to 20 users can be created, limited by the Max User Settings on the lower part of this screen. To Delete a User, highlight the user in the User List and select Remove. Anonymous User Settings: If desired, you can allow unrestricted access to the RPS-NODE-9258-WiFi by enabling the Anonymous Viewer Login. 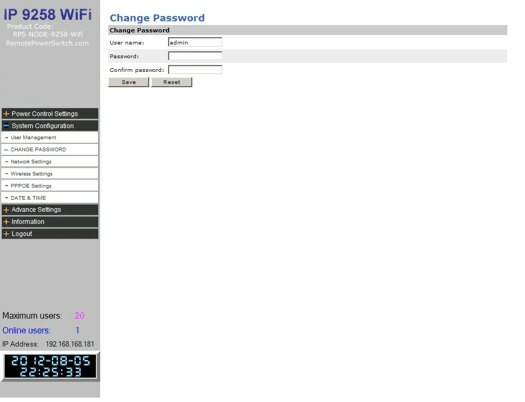 This page allows you to change the password for the RPS-NODE-9258-WiFi unit. You must login as administrator to change the password for the device. Type in the password and confirmation and click the SAVE button to store.